StART (St Ann’s Redevelopment Trust) http://startharingey.co.uk/ are setting up a community land trust in Tottenham and would like some help with fundraising, publicity, planning etc. START is a group of Haringey residents and workers who want to see the St. Ann’s Hospital site used for the good of the community, rather than in the interests of big developers. We want to plan and organise a community-led development with the full participation of local people, to provide genuinely affordable homes and other facilities that respond to local needs. Next year, two-thirds of the St Ann’s Hospital site is due to be sold for private housing development, with only 14% of the homes classed as “affordable”. The current proposal takes no account of the needs of local people at a time of severe housing need. Existing workspace and green space will be destroyed and turned over to expensive housing, putting huge pressure on local health services that are already stretched to their limit. We believe we can do better than this! The St Ann’s site is a public asset which could benefit the whole community rather than a few wealthy private developers, landlords and their tenants. Across the country, community projects are successfully raising funds and buying public assets for everyone to access – and we intend to do the same. We the undersigned petition the council to support the borough’s community-run Community Centres and their calls for secure, long-term and affordable leases. We would like the council to suspend the Cabinet’s decision to dramatically increase rents and reconsider shortening future leases of the many Centres in Council-owned buildings. We would like the council to work in partnership with Community Centres towards common goals for stronger communities facing challenging times. we would also like the immediate release of the ‘Community Buildings Review’ documents and data collected We believe our Centres are vital and popular community facilities, involving hundreds of the borough’s community groups and tens of thousands of local residents who use their facilities and hundreds of jobs depend on their existence. To thrive, such Centres need secure, long-term and affordable leases which enable, promote and guarantee community empowerment and self-management. Community-run Community Centres provide an unparalleled range of diverse services and facilities throughout the borough, based mainly on self-funding and extensive volunteering, saving untold sums of money for the Council and statutory services. We promote community cohesion, awareness and empowerment, and all kinds of cultural, educational, social and economic opportunities. In July 2015 Council officers produced a short report of the extensive 3-year long review of Community Centres based in Council buildings. The Council’s Cabinet unfortunately endorsed the report’s recommendations which boil down to a threat of much shorter leases (which would prevent long-term investment and strategic planning), impossibly high rents and much greater insecurity for those organisations and Centres affected, many of which will face closure as a result. This is complete contradiction to both the Council’s ‘Corporate Plan’ and its ‘Communities Strategy’ in which the Council says it ‘will work with communities to achieve their ambitions, by making best use of the strengths of the borough and ensuring that we build capacity and foster independence and self-reliance. Community Centres are central to the achievement of such aims, and to the ongoing provision of a whole range of services, particularly at a time when the Council is continually having to cut back on its own provision. This petition is submitted by Haringey Community Centres Network which includes The Asian Centre, The Irish Centre, The Selby Centre, Lord Morrison Hall, Jackson Lane, Lordship Eco Hub, The Markfield Project and the West Indian Cultural Centre. This ePetition runs from 09/10/2015 to 12/02/2016. 19:30: Coordination of responses and action plan ahead of the next consultation on the Local Plan: how can we object and respond to the proposals which might negatively affect existing communities and businesses in Tottenham? Haringey Council is currently in the process of updating the Local Plan which will define the future development of the Borough and of Tottenham. The Local Plan is made up of a series of planning documents that together form an overall set of rules. The council’s Planning Committee must normally take these rules into account when making planning decisions on things like new homes, shops and other facilities. This is why such documents are very important as they will guide much of the development that will happen in the next decade! Two documents are particularly important: the Tottenham Area Action Plan and the Site Allocations Development Plan Document. They set out the location, scale, guiding principles and timeframe for new developments on dozens of strategic sites in the Borough. Many of the proposals affect sites with existing viable uses, housing, shops, businesses or community facilities which could be displaced in the process. There will be a further round of public consultation on these documents in December-January. This will then be followed by an Examination in Public of the documents led by a Planning Inspector.Â This will be based on the legality and soundness of the documents, and will focus on the issues raised at the consultation. The responses people submitted last time had some impact – for example the ‘red zone’ threat to the open space of the Lordship Rec (in the Site Allocation DPD under no. SA63) was abandoned due to the volume of objections. HOWEVER, many of the responses and objections made by the Our Tottenham network and affiliate groups and other community organisations in Haringey and Tottenham are not going to be reflected into the new revised documents. We need to mobilise and prepare strong responses to the next round of consultation to make the voice of existing residents and businesses in Tottenham heard! It is really important that local residents have a voice in the consultation process as these documents will define the future nature of the developments which the Council will prioritize and give planning permission to in these areas. Come along to this Planning Workshop to find out more about that process and how to mobilise! All welcome to come and share views and experiences of community empowerment projects, groups and campaigns in Tottenham, and to join in a discussion about what we want to see around our neighbourhoods (and the whole of Tottenham) in the future. How can we publicise and coordinate our efforts effectively in order to make a real difference? Next year, two-thirds of the St Ann’s Hospital site is due to be sold for private housing development, with only 14% of the homes classes as “affordable”. The current proposal takes no account of the needs of local people at a time of severe housing need, workspaces and green spaces being turned into expensive housing and pressure on local health services. We believe we can do better than this! The St Ann’s site is a public asset which should be used for the benefit of the whole community rather than wealthy private developers and landlords. https://www.surveymonkey.com/r/C8WN8TJ and complete the survey. It will only take a few minutes. Can you also forward to everyone you know who live or work or play in the area, as we need as many replies as possible so we find out what people really want for the site. Want to improve Seven Sisters Market and restore Wards Corner? Want community-led development of the local area that brings benefits to the wider community? If you do, then come along to the launch meeting of the ‘First Steps’ project of the West Green Road/Seven Sisters Development Trust on Monday 28 September 6.30-8.30pm at the Bernie Grant Arts Centre. The First Steps project will set the Trust’s priorities across four key areas: 1) Business Plan & Funding; 2) Feasibility Studies; 3) Stakeholder Engagement & Communications; and 4) Governance. Come along to the launch meeting to find out more about the project, give your ideas and sign up for our new working groups. Now is the time to get actively involved in realising our shared ambitions for Wards Corner and the town centre. Please confirm your attendance to n15developmenttrust@gmail.com. If you can’t attend but would like to get involved, do also get in touch. Look out for more events in November and February. The Trust was set up in 2008 by four members of Wards Corner Community Coalition to provide a vehicle for community and business-led improvements to the West Green Road / Seven Sisters town centre. Its first project is to deliver the community plan for Wards Corner, which received planning permission in April 2014. Don’t sell off our public facilities and resources! 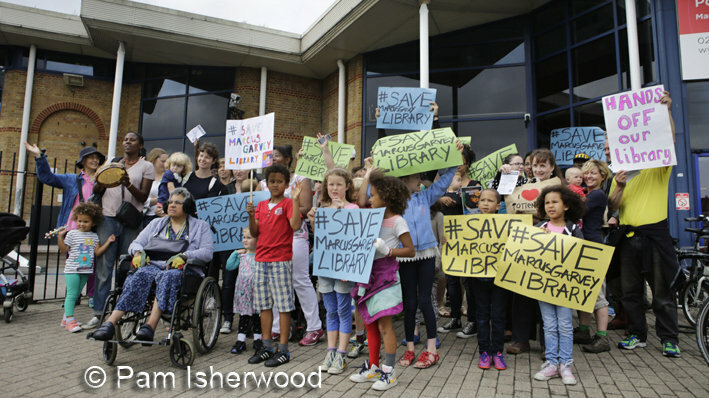 Watch the BBC interview and report of the Friends of Marcus Garvey Library protest on Friday to demand no to cuts to space or services. Why not plan an event to coincide with the week?! The Our Tottenham network are calling on people and groups to organise activities and events showcasing the collective power and concerns of those who live and work in Tottenham, and celebrate our strong and diverse communities. The week will be launched at the Efiba Arts Multicultural Festival on Tottenham Green planned for Saturday 10th October. – The Our Tottenham network had mooted the need for a community-run Community Centres network in 2014 as a result of the closure and demolition of the Welbourne Centre, threats to close Chestnuts Community Arts Centre, and an ongoing Review of Community Buildings by the Council. OT held 2 exploratory meetings. The OT network recently applied for and obtained grant funding from Locality ‘First Steps’ to help develop a such a Network.